Amanda Lowerre O'Donnell focuses her intellectual property law practice primarily on patent prosecution, patent licensing, and commercial clearance assessments, with additional experience with litigation and licensing negotiations. Within the realm of patent prosecution and licensing, she has primarily focused on mechanical technologies, business methods, and software. A skilled counselor on the leveraging of intellectual property assets, Amanda excels at helping clients maximize the value of their IP budgets by developing global filing and prosecution strategies that fit with each company’s customized needs and goals. Amanda has worked with clients in the U.S. and abroad in a variety of technical fields and product applications, including electronic components, food processing, packaging technology, and medical devices. She has focused experience in energy and renewable energy applications, including with carbon sequestration, photobioreactors, and distillation columns. 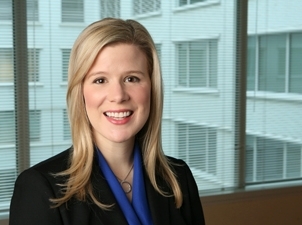 Amanda has counseled numerous clients on business method protections, including clients engaged in diverse technology applications such as insurance software and computer systems, Internet advertising and promotional methods, and social network applications. Amanda also has considerable experience advising clients regarding open-source software issues including licensing, conflict analysis, and risk management. Drafts and negotiates numerous licensing, development, and business agreements on behalf of clients of all sizes. Provides strategic IP counseling, including procuring trademark and patent rights, for startup companies. Advises a global consumer products company on numerous patent matters, developing strategies to protect proprietary ideas, and successfully prosecuting patents in key technologies. Successfully drafts and prosecutes utility patents for a leading global food and beverage company and for a multinational manufacturer of access control products. Conducts open source clearance reviews. Counseled multiple marketing and promotion agencies by conducting commercial clearance reviews and negotiating critical patent licenses. "Navigating Open Source Risk with Tools for Usage Evaluation and License Compliance,” Fitch Even Webinar, with Joseph F. Marinelli and Steven G. Parmelee, February 28, 2019. Advanced Patent Prosecution Workshop 2018: Claim Drafting & Amendment Writing, Practising Law Institute, Chicago, September 27–28, 2018. “Going Paperless: No Time Like the Present,” Chicago Bar Association, Chicago, September 12, 2018. Advanced Patent Prosecution Workshop 2017: Claim Drafting & Amendment Writing, Practising Law Institute, Chicago, September 12–13, 2017. Advanced Patent Prosecution Workshop 2016: Claim Drafting & Amendment Writing, Practising Law Institute, Chicago, September 14–15, 2016. Advanced Patent Prosecution Workshop 2015: Claim Drafting & Amendment Writing, Practising Law Institute, Chicago, September 10–11, 2015. Advanced Patent Prosecution Workshop 2014: Claim Drafting & Amendment Writing, Practising Law Institute, Chicago, September 11-12, 2014. “Ex Parte Prosecution?—Third-Party Pre-Issuance Submissions,” Los Angeles Intellectual Property Law Association’s 2013 Washington in the West Conference, Los Angeles, January 29, 2013. “Third-Party Pre-Grant Prior Art Submissions Under the America Invents Act,” Fitch Even Webinar, August 23, 2012. “Living in a Post-Bilski World; Has the Patent Office Succeeded in Taking the Abstract Out of ‘Abstract?’”, Fitch Even Webinar, August 25, 2010.